Since opening for business in 2006, Al Bandary Engineering – a member of Al Bandary International Group – has successfully executed a vast array of major construction projects in Qatar, forging its reputation as one of the industry’s most respected companies. Today, Al Bandary Engineering has a diverse portfolio of projects spanning builds such as high-rise developments, hotels, residential and industrial projects. Our Company combines a rigorous focus on outstanding construction with a dedication to superior client service. By listening to the needs of our clients and tailoring our skills to match accordingly, we demonstrate the ability to understand and successfully implement any project. Drawing on a workforce of 5,000 employees, as well as state of the art equipment, Al Bandary Engineering is uniquely qualified to tackle the most complex of projects. We pride ourselves that many of our senior management team have been dynamically dedicated to the company for many years. At the same time, we believe in complementing this existing strength by attracting and retaining the best new talents in the market. Each project we undertake has an assigned team of specialists whose expertise meets the specific challenge of the work involved. Teamwork is an essential part of Al Bandary Engineering culture, guided by project managers and senior management individuals, who display outstanding commitment and personal involvement in the successful execution of our major projects. Our track record demonstrates our clear-cut ability to put our values and vision into action. Industry recognition has also validated our success, with the company receiving many awards for its construction work. Our vision is to be leaders in the construction field, innovative in our technology, proactive in our management and transparent in all our dealings with clients. Our main concern is to be the leading provider of quality construction service, not only in Qatar but all over the GCC as well. To provide the highest service standards to our clients; ensuring career opportunities to our employees and continuous support to our society. To form long-term relationships of value with our clients and partners by using quality construction and engineering solutions whilst employing the best resources and latest techniques. Corporate Culture: Diversity and continued development, transparency, teamwork and integrity. Performance: Our company ethics navigate our day-to-day lives to deliver an expected high quality range of products and services. Since our founding in 2006, the business has seen a phenomenal growth that places Al Bandary Engineering among the top construction companies in Qatar. Our list of satisfied clients includes prestigious utility companies and construction firms. All projects receive the attention of our staff of Licensed Professionals, supported by our outstanding technical specialists, logistical and administrative project coordinators, and consultants. 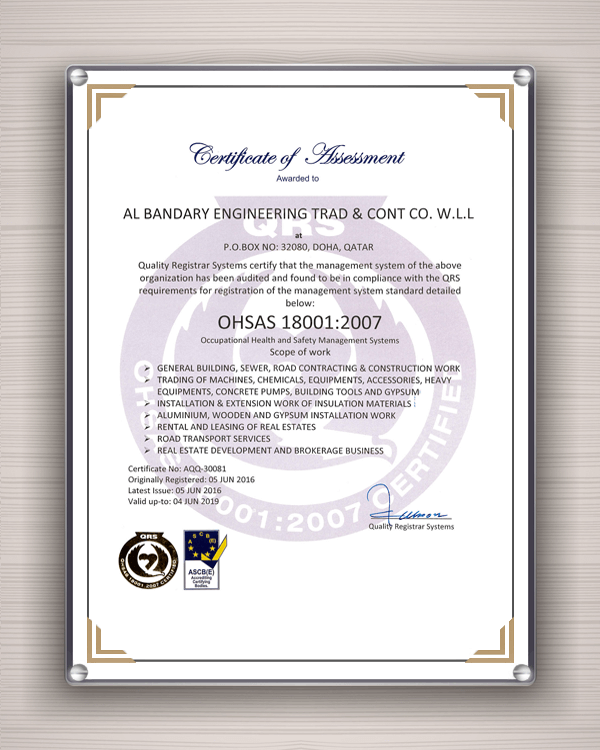 Al Bandary Engineering is driven by its objective of offering superior services and insuring the client satisfaction. The company’s exceptional performance in the regard has resulted an increase in turnover within a period of less than eight years. This success therefore shows the exponential growth of the company, and how through local knowledge and expertise Al Bandary Engineering can offer exceptional value in the competitive Qatari construction market. Al Bandary Engineering is a leading contractor in Qatar and considered an emerging strategic player in the market. Backed by the company’s sound financial base and strong investment in its plant, equipment and staff. Drawing on these strong resources, the company has earned a prestigious reputation, in particular for its civil and building works. The company’s proven track record includes the distinction of building many of Qatar’s iconic projects, as well as being involved in long-term partnerships with major business in Qatar. These prestigious projects have placed Al Bandary Engineering in its position as a leading company in the construction industry, having perfected its expertise in building various projects. In line with this dynamic growth, Al Bandary Engineering has increased its workforce, placing emphasis on recruiting and training the brightest talent in the market today. With over 5,000 employees offering a broad range of skills, each project receives dedicated focus and world-class expertise. With its state of the art plant and equipment Al Bandary Engineering handles projects combining the latest technology and professional teams to undertake a diverse range of builds. Al Bandary Engineering roots lie in the construction boom of 2006 with the company being the vision of Engineer Ahmad Al Rayyan, with the original vision of the company was to focus purely on the construction of properties. However the business quickly evolved with the emergence as Qatar as a major economic market. From simple roots the business quickly developed a number of subsidiary companies, which diversified to match the needs of the construction business. This lead to the wider Al Bandary International Group, which currently has a number of significant companies covering key areas such as: Construction, Real Estate, Hotel Management and Food & Beverage. Al Bandary Engineering forms the backbone of the wider group with over 60% of engineering staff forming the core of Al Bandary International Group. Since inception the company initially focused on the construction of villa complexes, with the first contract for work in 2006. This successful project was followed by a key number of projects. Again, evolving with the natural growth of the state of Qatar, Al Bandary Engineering started to win key projects working across a wide range of buildings. These have ranged from Commercial & Residential Projects, Factories, Hotels and Offices. After setting its roots in the market, Al Bandary Engineering has consistently demonstrated its fast-track capabilities, with the aim of constantly completing the projects on time, and meeting the clients’ expectations. Increasingly, Al Bandary Engineering’s expertise in the market is valued highly with the group working on a number of high profile projects in Qatar.